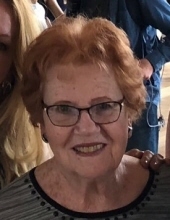 Helen A. Boylan, 82, of Bloomington, passed away at 3:15 a.m. on Thursday, April 11, 2019 at her home, surrounded by family. Her funeral will be held at 10 a.m. on Monday, April 15, 2019 at Holy Trinity Church in Bloomington, with Monsignor Douglas Hennessy and Rev. Jeffrey Stirniman concelebrating. Interment will be at St. Mary’s Cemetery, Bloomington, immediately following services. Visitation will be on Sunday from 2 to 5 p.m., where a rosary will be recited at 1:30 p.m. at Carmody-Flynn Funeral Home, Bloomington. In lieu of flowers, memorials may be made to Holy Trinity Parish. She was born June 29, 1936 in Bloomington, daughter of James and Josephine Hayes Gould. She married James E. Boylan on June 25, 1960 in Bloomington, he preceded her in death on February 13, 2003. She was also preceded in death by one daughter, Teresa Boylan; two brothers and three sisters. Surviving are three daughters, Elizabeth (Terry) Longman, El Paso, Janet (Eric) Mueller, Bloomington and Karen (Leon) Chism, Naperville; three sons, Daniel (Jane) Boylan, San Diego, CA, Patrick Boylan and Mark (Nancy) Boylan, both of Bloomington. Also surviving are 11 grandchildren, Paula and Margaret Longman, Breanna, Mitchell and Gavin Boylan, John and Anna Mueller, Katherine and Kelly Chism and William and Katherine Boylan and one great-granddaughter, Josephine Longman. Helen was proud to have attended a one-room school house in Merna, where her sister was her teacher. She received her Bachelor’s Degree in Education from Illinois State Normal University and worked as a special education teacher in Lombard and later in Towanda. Helen taught until she began a family of her own, where she stayed home to raise her children and help her husband at the family business, Boylan’s Candy, in Bloomington. She enjoyed playing bridge, reading and working crossword and jigsaw puzzles. She also loved bird watching and was an avid Chicago Cubs fan. Helen was blessed with many close friends and she cherished her time with her grandchildren and many nieces and nephews. "Email Address" would like to share the life celebration of Helen A. Boylan. Click on the "link" to go to share a favorite memory or leave a condolence message for the family.